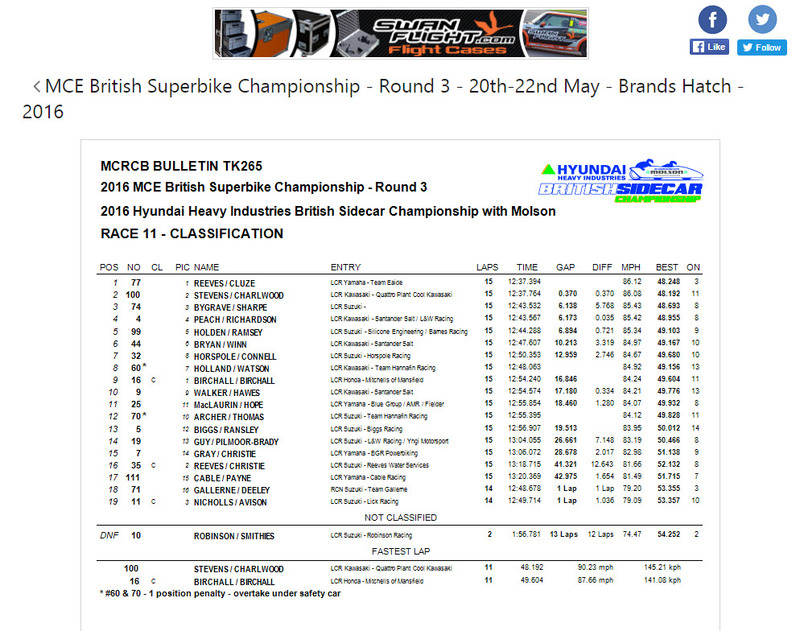 Ben and Tom Birchall travelled to Kent for the second round of the Hyundai Heavy Industries British Sidecar and Cup championship at Brands Hatch resulting in two resounding victories for the Mansfield team. Using a 600cc Honda engine in the LCR chassis the Mitchell’s of Mansfield supported riders were contesting the Cup section of the British championship which runs within the main race for the larger engine capacity F1 outfits. 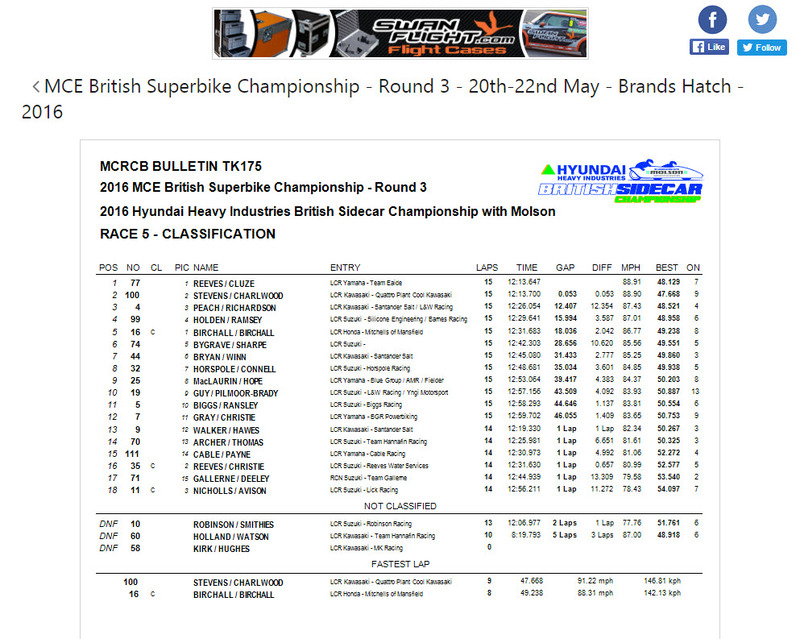 The Birchall brothers qualified their long wheelbase LCR in an overall position of sixth and began their challenge from a third row grid position. As the lights went out for the start of the 15 lap race Ben (39) and Tom (29) maintained their sixth place within the mixed grid of riders and were leading the Cup by a considerable margin. They moved upfield to fifth on lap 11 and crossed the finish line in that position to take a well earned win in the cup. Once again starting from the third row, Ben and Tom began their second race on Sunday in 10th place. They moved up to ninth on lap two but their progress was halted by the pace car which was brought out to allow for the safe removal of a crashed outfit. Once the car left the track they were overtaken by some of the more powerful F1 machines but as the race progressed they got their heads down and began to reel in the outfits ahead. By lap 11 they were in 11th position and on the penultimate lap they passed Walker/Hawes and Archer/Thomas to cross the finish line well ahead of many of the F1 competitors in ninth place and once again took a decisive win in the cup class. Ben said: “We had another great weekend here at Brands Hatch and we are really pleased to be leading the championship by such a great margin. I have to thank all our supporters and sponsors for their continued support. With these two wins Ben and Tom Birchall have a commanding lead in the championship with 30 points from nearest rivals Reeves/Christie on 14.. The next round is at Knockhill on June 26 but the Birchalls along with one or two more competitors will be away in Hungary on World championship duty. They will return to the domestic scene at Snetterton on July 10th. Their attention now switches to the Isle of Man TT races where last year they won both races giving them a total of three wins overall. Practice begins on Monday through to Friday with the first three lap race on Saturday, June 4 at 2pm, this year the programme has been altered and the second race will not be run until the final day, Friday, June 10 at 10.15am.